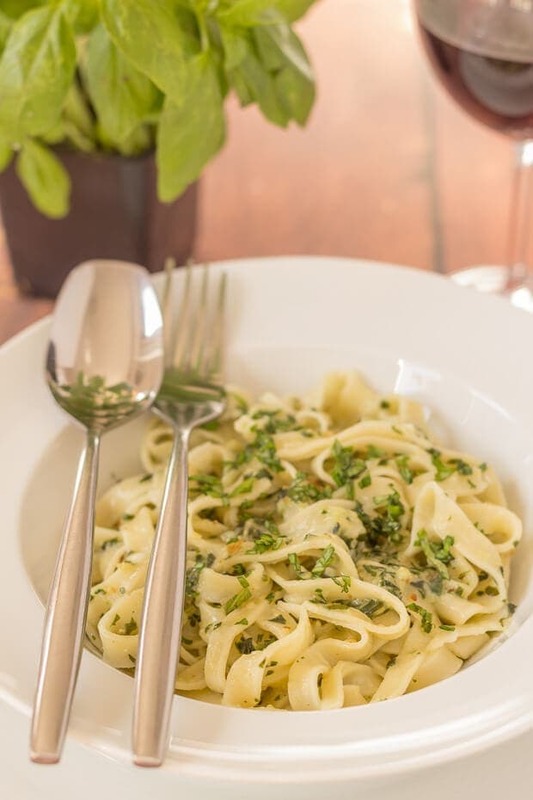 This tagliatelle with home-made pesto recipe is a step by step guide for how to make your own tagliatelle and your own home-made pesto. Impress your friends and dinner guests with your culinary skills with this simple, rustic Italian dish. 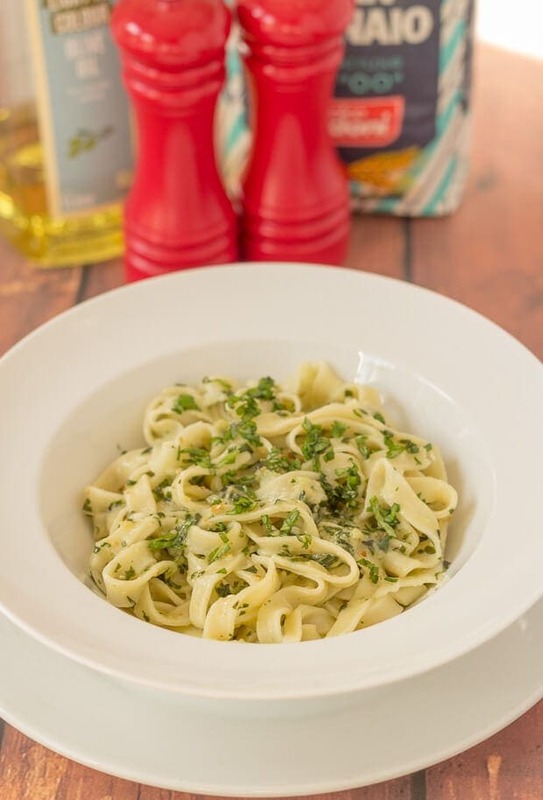 Although this tagliatelle with home-made pesto recipe is designed to serve one, the quantities used can easily be doubled up to serve 2 or more. You see the reason why this recipe is for one is because it’s one of my first recipes for making home-made pasta from scratch, and I wanted to share it for that reason. Because, if you’ve never tried to make your own home made pasta or pesto, then this recipe is for you. And once you’ve perfected it, which really doesn’t take any time at all, you’ll be making this for your friends and dinner guests for ever more. I still make this tagliatelle with home-made pesto dish for Lady Lynne, and she still loves it! Firstly, in a food processor, pulse together all of the pasta ingredients until they resemble damp breadcrumbs. Then, dust a work surface with some pasta flour and knead the pasta for 2 minutes. Form into a ball, wrap in cling film and put into the fridge. At this point you should follow the instructions in the recipe card to make the home-made pesto. 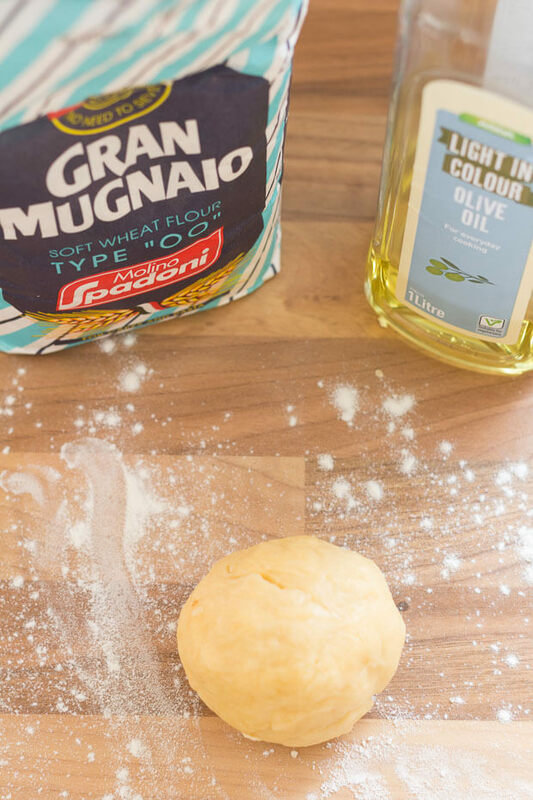 Once you’ve done that and the pasta has rested for at least half an hour in the fridge, remove it and roll it out, using a rolling pin on a lightly floured surface to be as thin as possible. It should be nearly see-through. Then you simply cut the pasta into fine long strips of approximately 0.5cm wide by 30cm long. I use a pizza cutter and the edge of a plastic board to cut out the strips. Finally it’s just a case of cooking the pasta for 6 – 8 minutes in a saucepan of boiling water, draining it, adding your home-made pesto, mixing it together thoroughly and serving! 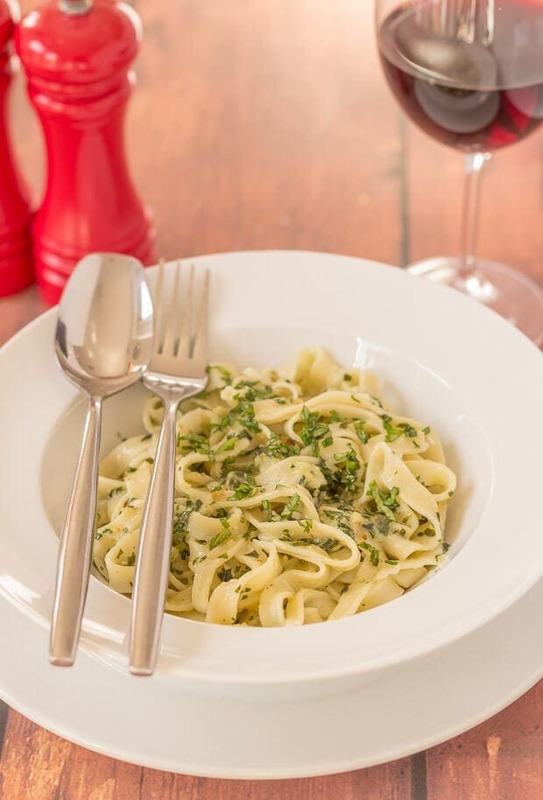 Although I do encourage the use of wholemeal flour in most of my recipes, and it is healthier, in this tagliatelle with home-made pesto recipe it’s actually easier to use proper “00” grade white pasta flour to roll out. 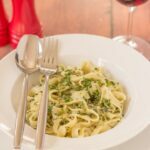 This tagliatelle with home-made pesto recipe is a step by step guide for how to make your own tagliatelle. If you have a food processor, pulse together all of the pasta ingredients until they resemble damp breadcrumbs. If you do not have a food processor, fold the ingredients together in a mixing bowl. Dust a work surface with some pasta flour and knead the pasta for 2 minutes. Form into a ball, wrap in cling film and put into the fridge. If you have a food processor, blitz the basil leaves, then add the pine nuts and garlic and blitz again. 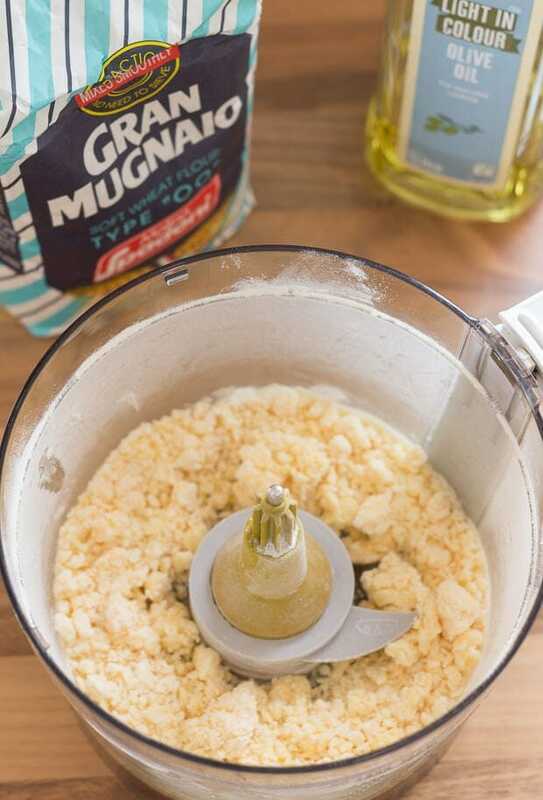 If you do not have a food processor, use a pestle and mortar, or sturdy bowl and the end of a rolling pin to bash the basil leaves into a pulp first, then add the pine nuts and garlic and bash them all together into a pulp. Remove the ingredients into a separate bowl, add the oil and parmesan cheese, mix all together and put the pesto the fridge. 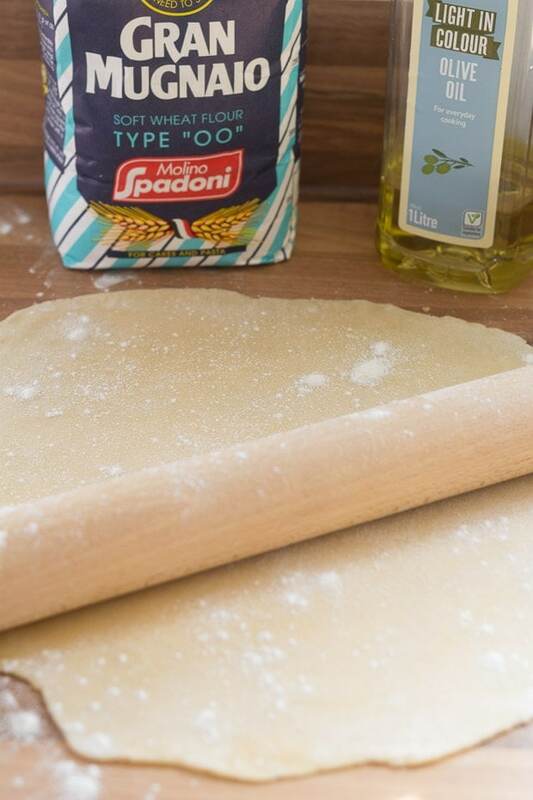 Once the pasta has rested for at least half an hour in the fridge remove it and roll it out, using a rolling pin on a lightly floured surface to as thin as possible. It should be nearly see-through. 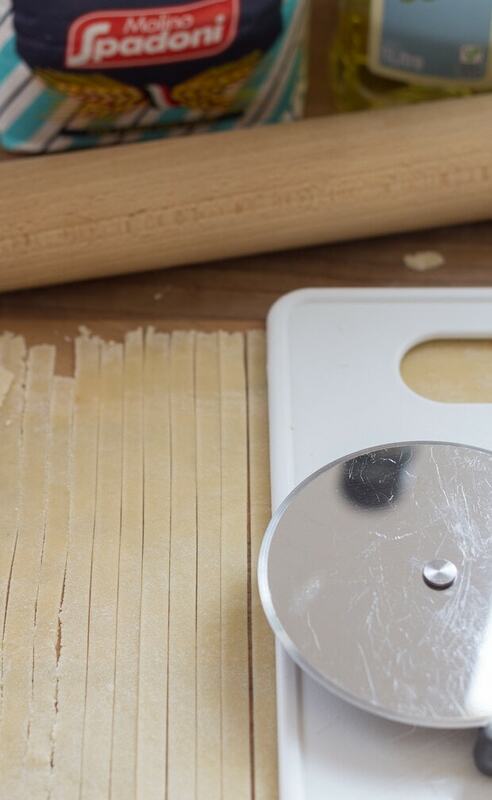 Cut the pasta into fine long strips of approximately 0.5cm wide by 30cm long. Cook the pasta for 6 – 8 minutes in a saucepan of salted boiling water. Once the pasta is al-dente (cooked) drain it into a sieve, then return it to the saucepan and add the pesto mixture. Mix together thoroughly. Serve in dishes or bowls topped with finely chopped parsley. You can make the pesto at any time which can be stored in an airtight sterile jar in your fridge for up to 3 weeks. I do love pasta but we generally only have it once a week, on a Tuesday night, when I know I will run off the excess carbs gained, on the Wednesday morning run at the gym!